Hello Dear Reader, just a quick check in, I had originally planned to blog yesterday. However, screen shots of apps made for a terrible looking blog. Fortunately I found that Lose It! has an option where you can email a daily report in .csv format to yourself. After a few edits to add some health data, I can use Power BI to make a nice way to track and chart my process. So on Day 1 there was no work out, but I did clean the garage so I would have room to work in some weights and an exercise bike. While the majority of my goals are running I'm only running 3 days a week and giving myself two days of rest between weeks. I want to start with light activity, but I would like to remain active or exercise daily. My first day, not charted below, I was way to high on protein and not high enough on fat. One of the things that helped me with that is a Keto coffee, sometimes refereed to as Bullet Proof coffee. Bullet Proof is a brand that popularized this type of coffee. If you want to go with them, feel free. They are fantastic. However, if you are on a budget or looking to save some money here's what I normally do. 1 Tablespoon butter. Non-salted. Real cream butter, don't cheap out here go for the good stuff. I recommend Kerry Gold. You can find this for about $3 at any grocery store. MCT Oil. If this is your first time use 1 teaspoon. This ingredient is important. I use a gluten free version, here's the bottle I buy. I use about 1 tablespoon now, work up to it. This bottle will last me well over a month. You feel the energy kick right away. I find this helps increase my focus as well as my energy. It's about 225 calories. As I get going this will be all I have for breakfast eventually. Some people put heavy cream in their coffee to add more fat. I don't tend to do this, as I use those calories other places during my day. I was planning the evening meal for the family when I was genuinely surprised to find low carb tortillas at my local Publix. It was Taco Tuesday last night. This would have meant Dad eat's a bowl of meet, cheese, onion, avocado, and cilantro; while the family eats regular tacos. Part of keto that I've never enjoyed is the having to watch people eat something while you go without. This opens up a whole new world of possibilities. Enchiladas, tacos, quesadillas, toasting them to make chips with olive oil, sandwich wraps, or breakfast burritos the mind boggles at the possibility. Part of what makes them low carb is the fiber. That's right FIBER IS OUR FRIEND. You subtract carbohydrates from fiber to get net carbs. Net Carbs are the number you are counting for keto. Peter Schott had asked me which tortillas I was using. I've added a picture above. Here are the details. 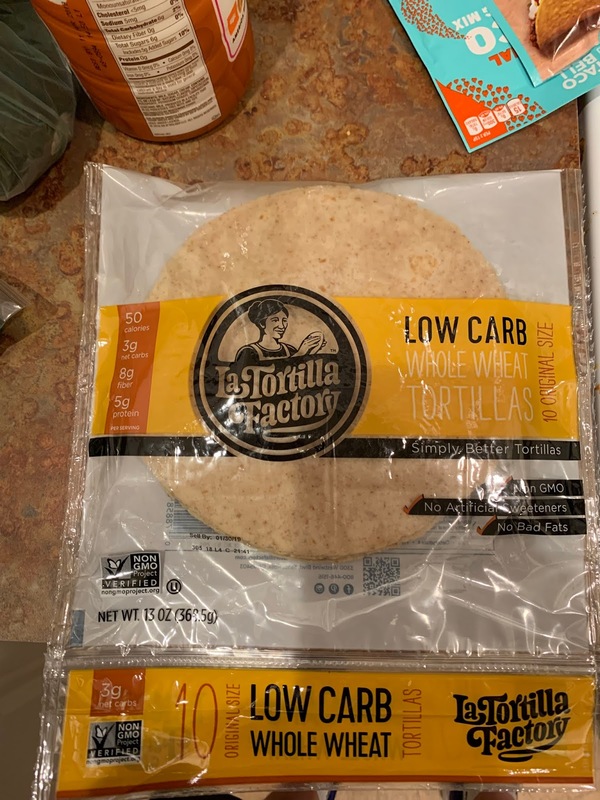 LaTortilla Factory Low Carb Whole Weat Tortillas. 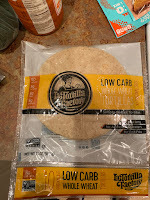 LaTortilla offers a whole wheat and flour low carb tortilla. I prefer the whole wheat because they are 3 g of net carbs vs. the flour which are 4g of net carb. The flavor is good, they toast well in a pan. This morning I had a scrambled egg, cheese, and avocado spread (my own recipe) for breakfast. At this point i wish i had taken a picture, I'll have to remember to do that next time. If you do not have a Publix where these are stocked, it looks like you can also buy them on Walmart.com and Amazon.com. Normally at Publix and 8 pack is less than $4. Third party companies look to be selling these and charging upwards of $10 per. There may be better options if you cannot find them at your local store. I say all this because I would normally post links for purchase. Looking at a price of $10.95 to $14.95 when I'm paying less than $4 seems like highway robbery, so I shall let you search for yourself. Thanks for the question Peter! I've stayed below my calorie count regardless of exercise or move bonus for the last two days. Even though I'm exercising I'd rather not over eat. Day 2 brought the first work outs, stretching followed by a 2.05 mile run. Lots of work to do on my pace, but to quote the old Chinese proverb "the journey of a thousand miles begins with a single step". The journey has begun. Alright Dear Reader, that's it for my morning. If you are trying to find your way to the gym, good luck and stay safe! Hello Dear Reader, it's been a while since we talked. Part of the new year is setting goals. I plan to blog more. I also plan on trying to get in better shape and lose some weight. Weight loss has been a constant issue with me since my thirties, now in my forties, and I imagine it will chase me for the remainder of my life. This year I'm going to try using the Keto diet and some training. I've signed up for a few moderate to long distance running races, and I need to get moving. I've run in the past, but then I hit a lull and the weight catches up with me. 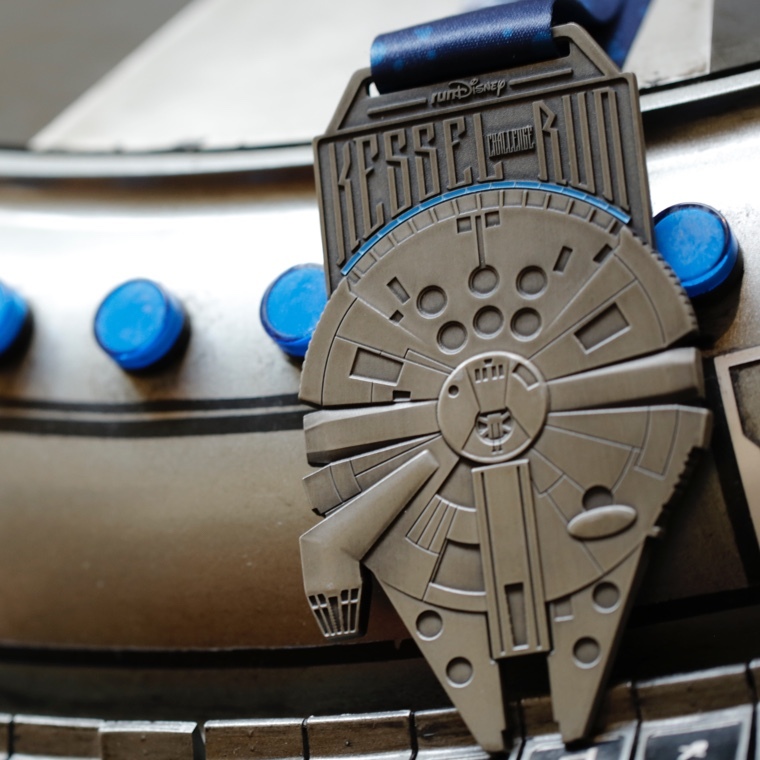 The big goal is the Kessel Run & the Star Wars Challenge that will come with the completion of a virtual half marathon, a 10 K, and a half marathon at beautiful Walt Disney World. There's still time to join if you are interested! These are some lofty goals as I have not run since September, I have not been dieting, and I came to the realization squeezing my beer no longer counts as bicep curls. There will be cheat days. There will be days that I fall off the wagon. To hold myself more accountable, I'm going to attempt to blog about this every day until April 8th, 2019, the day after the race. If my buddy, Gareth Swanepoel (@GarethSwan), and I get our act together it may be until Monday April 15th. So I'm out of shape, overweight, and I've got a lot to accomplish. To do this I'll be using a few apps to track my process and progress. I've been using Lose It! for almost 2 years now. Meals, recipes, calorie tracking, and weight loss & gain will be tracked using Lose It! For my initial run training I'll be using C25K, I've found this app really helps me when I first start going. Once I can hit two and a half to three miles on my own I'm going to start using Seconds Pro. Seconds Pro is a great interval timer that allows you to do Tabata like works outs. I used this once before and it really helped me step up my pace once I was in better shape. The method was suggested by a friend of mine. The method is for the first minute jog 30 seconds, job faster 15 seconds, and sprint for 15 seconds. Then for the following minute walk. I look forward to working up to using this again, it helped me move from 3 miles in a run up to 6 miles. I would like to be at that point before the race in April. The built in Apple Health Activity App on my Apple watch will track the calories I burn per day and while I exercise. Those calories will feed straight into Lose It!. I had originally written this post and neglected to add that I'm an asthmatic. I have allergy and athletic induced asthma. I've had this since I was a young teen. As I've grown older this has made me particularly susceptible for bronchial and lung infections. Fifteen minutes before I run I will use my rescue inhaler. I wish I didn't need this, but I do. I wish this went away when I get in really good shape. It does get better, but it is still there. This is just me trying to say, if you have asthma don't let that stop you. I have had my inhaler with me when I played football, wrestled, played soccer, or played any other sport for my entire life. The biggest issue I will face will be not pushing myself so hard that I pull a muscle, at this point I can handle my asthma. I blame my good friend Jorge Segarra (@SQLChicken) for this. The Keto Diet entered my life almost 2 years ago this coming September. Click on the link above for more detail on the Keto Diet, my quick 10,000 feet overview is it is a low carb diet where you flip the food pyramid on it's head and fat is the most important nutrient for our body. One of the really amazing side effects of Keto is that the hunger feeling you have known your entire life goes away. Seriously. You feel like you have a lot more energy. While you can find many different opinions on this, the evidence I have is based on my own experience. I went Keto before a half marathon last year and I did not need anything but water, and lots of icy hot, until the race was over. My pace was 3 hours and 34 minutes. I didn't carbo load anything, I didn't use power gels, or snacks along the way. As a matter of fact I did the opposite, you have to be at the race by 5 AM. My 4 AM breakfast was two eggs over easy, two sausage patties, three slices of bacon, cheese, all topped with homemade ranch dressing. After 3 hours and 34 minutes of exertion almost 6 hours after my breakfast I was finally hungry again. During the race I focused on staying hydrated, re-applying sun block, and the occasional use of my inhaler. If I can do that again I'll be happy. Along the way I'm going to attempt to do a daily update with a screen shot of my meals and weight tracking in the Lose It! app, updates on the activities I'm doing screen shots of pace and calories burned, recipes, or products if I find some good stuff along the way. 83 days to go until race day. Whether you are hear for a moment, or along for the ride Thank you as always for being here Dear Reader. I hope you have some goals for the new year as well, and I'd love to hear from you if you have one. Hello Dear Reader! Sorry it has been so long, I've been blogging over on the MSDN site about technology. 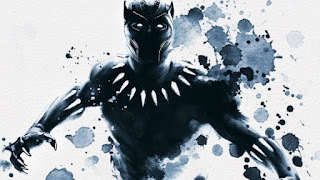 I'll have a Twitter Sentiment update for Black Panther later today with an update on Tuesday for the holiday weekend. Since the early 2000's a trend of Superhero movies began, comic book geeks cheered but many in the industry couldn't wait for it to be over. They viewed it as a trend. You need only search on Bing or Google using the term "super hero movie saturation" to find headline after headline of Actors, Directors, or Industry Trades predicting their demise like that of a Hollywood villain standing over his captive foe. Every year we see more and super-hero themed movies entering the market. Naturally, after living through so many economic bubbles may predict that this is a bubble that will pass. This regulates comic books from an artistic medium to the simplistic story of good vs. evil. Even comic book websites have gotten in on the fun. The Comic Book Reporter had a headline last month that said Hollywood Is Nearing Its Superhero Saturation Point. In it author Narayan Liu expresses the final point, "cinema will change as it has always changed. In the 60's and 70's the fad was spaghetti westerns, then space dramas...For now, superhero films reign supreme, but eventually that will come to and end sooner or later." Stories about people with powers and abilities far beyond those of mortal man are tales as old as time itself. The representations used to be God's, then myths, now they are heroes. Stories of Superhero's for the sake of Superhero's fail. The best movies are those that seek to tell a story, and whose characters are empowered in a way we have not seen before. Batman The Dark Knight was a success that has lead to the only Oscar Win in a major category, Heath Ledger for the Joker. However, taking the "dark" theme and using it over and over again lead to decline of Warner Bro's DC Superhero franchise. Justice League never came close to making back its lofty $300 million dollar budget in Domestic box office receipts. To cast off mythical stories of empowerment as purely "Superhero" is the equivalent of asking "How do I cook", and at seeing the silverware saying "I've seen enough". The formula that works for superhero movies is the same that works for all other genres, good stories equal good movies. There are so many more stories being told in this medium than what we have seen thus far and now we stand at the edge of a new revolution. Marvel CEO Issac "Ike" Perlmutter made headlines when an internal email leaked on "why he doesn't believe in female superheroes". Wonder Woman changed the typical sentiment of a strong female protagonist leading a movie not being able to reach a massive audience. It was profitable, very profitable. One thing Hollywood does well is capitalize on a trend. Wonder Woman is going to have a highly anticipated sequel. Captain Marvel, staring Brie Larson, is currently filming and news that Marvel is finally going to make a, long over due, Black Widow movie, staring Scarlett Johansson, has moved to development stages. Part of Marvel's move also comes after Perlmutter's comment and the move on Disney's part to have Kevin Feige report directly to Disney Studios chief Alan Horn. So what does this have to do with Black Panther? Everything. Minority superheros are a long missing block from comic books as a whole and almost all together from this landscape. Robert Kirkman's AMC Series Secret History of Comics covered in-depth the rise and fall of Milestone Comics. Milestone was an African-American-owned comic book imprint from the 1990's that brought characters Hardware, Icon, Static, Blood Syndicate, and many more were characters synonymous with the comic book revolution of the 90's. This isn't even bringing forward the story of Marvel's own Blue Marvel, Dr. Adam Brashear. His story tells the tale, written in the Adam: Legend of the Blue Marvel in 2009, telling the tale of America's greatest superhero asked to retire when his costume is torn during a fight that leads to the discovery that he is a black man in 1960's America. Comic books stories are the modern tales of empowering people. There are many minority characters in DC, Marvel, Image, and Top Cow that have not yet been told. The success of Black Panther, I'm predicting a $185 million opening with a final gross of over one billion dollars world wide, will inspire more stories. The stories we have not yet heard are the voices of those who deserve to be empowered and have not. No spoilers here, but a few words on the movie itself. The cast is incredible, and their talent is on full display. I saw the movie in IMAX 3D, and it is breath taking. The background visuals, the architecture, the landscape are all breathtaking. The villain has real depth, and though there is no doubt who our hero is he is conflicted as well. The conflict is so understandable, so sympathetic that it touches on philosophical context and modern social parallels. By sparing the current generation pain, can that then create a monster that future generations will have to endure? What should the role of a national super power be in the world? We touch on the subjects of immigration, accepting refugees, hiding behind walls, or building bridges. In all the modernism one though was not lost on me. The way that generations have idealized Camelot, is Wakanda the new Camelot? A technological marvel, a nation at peace within its boarders, and a place where those who have never felt truly represented rule with mercy and grace. Look on social media and you may see #BlackPantherSoLit trending. Look at the empowerment of those attending. If you only look at superhero movies and see the costumes and not the story this is your chance to look around you. Look outside of the theater, see what this means to people, and watch over the next few years to how this inspires the world. What are you doing still reading this? Go see Black Panther already! !